Motivated by the Skycrane that NASA planned to carefully land Curiosity on the Marian surface, the European Space Agency has revealed its own form of the rover-on-a-rope conception: the Dropter. 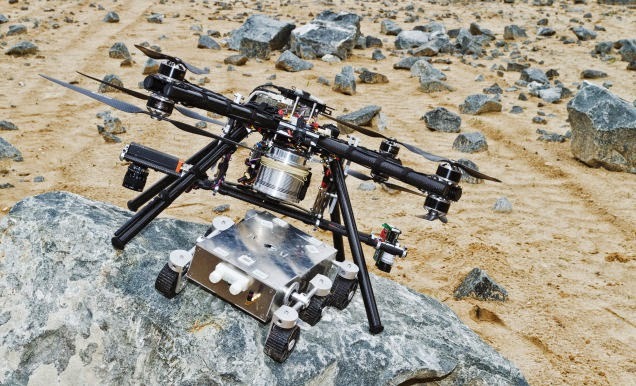 An engineering group consumed eight months developing the Quadcopter dropship, which is intended to transport rovers to their target landing spots while avoiding rocky grounds, inclines and other threats. The flight test was directed at Airbus's Trauen location in northern Germany, where a 17,000-square-foot covering of simulated Martian land was made. After reaching to a height of 55 feet, the Dropter lessened its altitude until it was 32 feet above the surface, at which point it initiated dropping a fake rover on a 16-foot-long bridle, ongoing to lessening height until the rover touched the ground. The Dropter used GPS and inertial methods to fly into the required spot, and then swapped to vision-based navigation accompanied by a laser range locator and a barometer to unconventionally land the rover without hitting it against any of the rough rocks. Having validated that the idea is practical, the European Space Agency says that it will carry on assessing its promising use for future planetary tasks.